Dr Brenda Boardman reflects on the world's energy situation, climate change and the growing problem of fuel poverty. She gives practical advice on how this affects building or renovating a property. Dr Boardman talks about her career and how she came to work in the Environmental Change Institute of the University of Oxford. 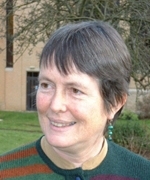 She started her first degree at the age 30 and became a graduate of The Open University, after which she did a doctorate at SPRU (Science and Technology Policy Research) at the University of Sussex. This doctorate was then published as a book called Fuel Poverty: From Cold Homes to Affordable Warmth. Despite what politicians say, a great deal of the UK's environmental legislation starts in Brussels. Dr Boardman believes that when it comes to environmental issues and energy-efficiency, the UK would not be as good as it is without this European direction. Under Margaret Thatcher's Conservative government there was a reluctance to accept that fuel poverty was even an issue. It was only when the Labour government was elected in 1997 that the problem was finally acknowledged. There is a difference between fuel poverty and poverty. When you use energy you actually have to have a piece of capital equipment (for example a light bulb, a TV, a house etc.) to turn that energy into the service you want. The role of capital equipment and expenditure on capital equipment in fuel poverty is crucial for differentiating it between ordinary poverty and fuel poverty. You can cure poverty by giving people more income, you cannot sensibly cure fuel poverty by doing the same thing because it just recurs and recurs and recurs. A one-off big capital investment in energy-efficiency could take somebody out of fuel poverty. Dr Boardman says that there was initially a debate as to where the focus should be, climate change or fuel poverty. It soon became clear that we must treat them as a whole. She stresses that there are some real problems if you don't bring them together. While the targets may be good, Dr Boardman is disheartened that there is no commitment to achieving them. In terms of energy-efficiency the UK's housing stock is some of the worst in Europe, despite improvement programmes being in place since 1976. Dr Boardman describes how we've made a big mistake by looking at the amount of running costs that an energy-efficiency measure would save. Increasingly they don’t justify the expenditures. Loft or cavity wall insulation might save you some gas (typically) but solid wall insulation is not so straight forward. Dr Boardman links it back to the running costs versus capital issue again. In the UK there are Energy Performance Certificates (EPCs) and if a house is categorised in band ‘A' it is considered very energy efficient whereas a house in band ‘G' (the bottom category) is considered very energy inefficient. Dr Boardman suggests that an A or B-rated property should be worth quite a lot more than an F or G-rated property. This would create a double benefit: it will save running costs and will increase the value of the property. Different people in the population are likely to respond to different messages. Some people will respond to being green and helping the planet, some people will respond to reducing their running costs or increasing the value of their house and some people will just respond because it’s a much nicer environment inside. There is no absolute requirement to make these changes and that means the money could be spent elsewhere, perhaps on a holiday. A lot of the measures are not something you can see. Dr Boardman explains a term that sociologists use called ‘agency', which enables you to complete the circle. An example she gives is how recycling used to be, where you did it in your house and then transported the recycling to a given location. Now the process is much simpler and easier. There are different colour boxes and someone comes to empty them! There is nothing that makes it easy to implement energy-efficient measures and there are no guidelines of what we should all be aiming for. 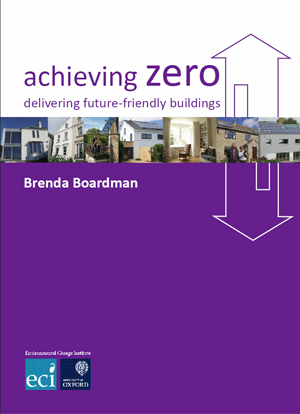 Dr Boardman's latest publication looks at how to get all energy use in all buildings in the UK to result in zero carbon emissions by 2050. That is part of the UK's legislative obligation under the Climate Change Act. The UK government is suggesting that we switch to electric heating, using air source or ground source heat pumps. It also wants to see more nuclear power stations, plus putting carbon capture and carbon storage on existing power stations. This will result in the decarbonisation of the electricity industry. Dr Boardman doesn't like or agree with these assumptions, as she believes it can't happen fast enough and, if it did happen, the resultant electricity might be extraordinarily expensive and therefore not good for the fuel poor. Taking an energy efficiency approach, there would be no need to put up the cost of energy in order to pay for new power stations. The price may still be high per unit but you’ve reduced the cost because you’ve reduced the need to buy so much gas or so much electricity. Dr Boardman's latest research concludes that we must eradicate the need for heating systems by making super-efficient homes. In her opinion the best way of doing this is to make every building in the UK Passivhaus standard by 2050. 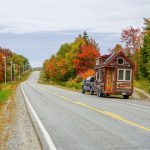 There may still be a few wood stoves, some under-floor heating or electric heaters on the intake of your air for your mechanical heat recovery but basically there are no heating systems. Keeping climate change, global warming, to an increase of two degrees centigrade is nearly impossible now. This is over the level of the Industrial Revolution. As we’re more likely to be heading for an increase of three and four degrees this risks the bigger problems. Four degrees warmer is perceived to be risking catastrophe: really nasty extreme weather in really unusual places and fast sea level rises. Dr Boardman believes we are a long way from hitting our targets. One of the most challenging is that, for the UK, 15% of energy should come from renewable sources by 2020. With 7 years remaining, the target will be really tough to achieve and there are hefty fines to pay every year that this is missed. This is nothing to do with price, just for the climate. The implications of changing the climate, as Lord Stern proved, could be hugely expensive and disruptive. Dr Boardman again points to running costs versus capital costs. The cost of energy in future in a small concern when we consider how the climate could impact on our infrastructure, our lifestyles and our choices. 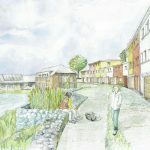 One of the reasons Dr Boardman likes the Passivhaus standard is because she has more faith in its modelling and algorithms compared to the Standard Assessment Procedure (SAP). Dr Boardman reviews the progress the UK has made so far over 30 or 40 years. 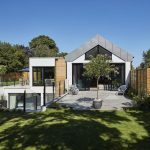 According to the Standard Assessment Procedure (SAP) the UK has improved the energy-efficiency of its housing stock by one SAP point per annum (the maximum being 100). Currently the average in England is about 54. So to reach a score of 100 by 2050 would mean climbing 46 points in 38 years. Dr Boardman highlights how this is not much faster than one SAP point per annum and thus it's still a possibility. Dr Boardman advises all of us to consider how we will get our homes to become A-rated buildings by 2050. This could be achieved incrementally on a room by room basis (a piecemeal approach) or could be done in one go a few years down the line. Plot your trajectory over the next 37 years. There is also another issue to consider with new builds, that they do not reach the standard that is in the architect’s drawings. Dr Boardman hopes that we’re moving towards standards based on the property ‘as built'. She points to the Passivhaus standard and how it requires an air leakage test after it's built. Dr Boardman says that normally energy-efficient homes in the UK refer to reducing gas use (meaning better insulation, a better boiler, etc.). While it is true that 85% of our energy, measured as energy, is gas use and the other 15% is electricity, electricity is both carbon intensive and expensive on peak electricity (when lights and appliances are used most). 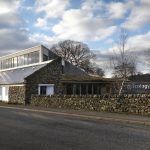 If you look at expenditure or carbon it’s about the same, something in the region of nearly half of the carbon and nearly half of the expenditure goes on electricity and this is another reason why Dr Boardman likes the Passivhaus approach. It includes all those ancillary uses of energy in one of its measurements. 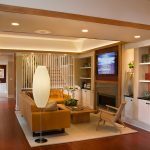 Dr Boardman believes that it could be toughened as it actually allows us to have too many pieces of equipment and semi-efficient light bulbs, CFLs (compact fluorescent lamps) rather than LEDs (light-emitting diodes). Dr Boardman would like the Passivhaus energy standard, as opposed to heating standard, to be toughened. To achieve a zero carbon house, you’ve got to look at the way you use electricity. Dr Boardman concludes that the environment needs to feature more prominently in future elections. These issues have to be considered as the mainstream rather than a minority view. Download a transcript of the interview with Dr Brenda Boardman. Ben Adam-Smith explains how a volunteer from the Transition Network knocked on his door and offered a home energy-efficiency review. This report was very helpful and highlighted a couple of areas where Ben could immediately take action. Ben was also loaned an energy monitor, which has helped him get a better feel for which gadgets use the most power (no surprises about the kettle!). Check out episode 36 of the Construction Industry Podcast, where Ben Adam-Smith chats to Cesar Abeid about self-building and the need to focus on energy-efficient homes.